The Lady Americanist (at Work). 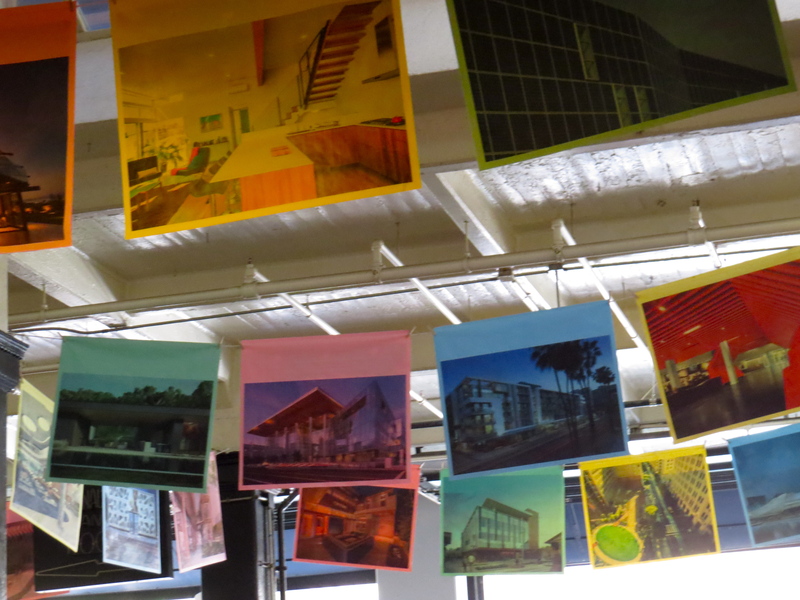 | At the Intersection of Art, Culture, and the Corporate World. The Lady Americanist (at Work). At the Intersection of Art, Culture, and the Corporate World. An Americanist on the Prowl. Hello, I’m the Lady Americanist, and I’m a Disney-phile. Much of the Disney scholarship out there is critical of the company and the messages it sends out or the historical perspective and myth-making in action in the parks and films. I absolutely agree with some of it, but I still get a lump in my throat when I walk down Main Street U.S.A. to Cinderella’s castle, and I still get goosebumps when I ride up into Spaceship Earth. Once, on a family vacation, we were pulling up to our hotel, the Contemporary, and as the Magical Express bus pulled into view of Cinderella’s Castle, “When You Wish Upon a Star” came on my iPod, and I cried real big tears. I love sharing the movies with my son, and one day, my dad and I WILL go on a tour of the Utilidors. All that said, I have a conflict. 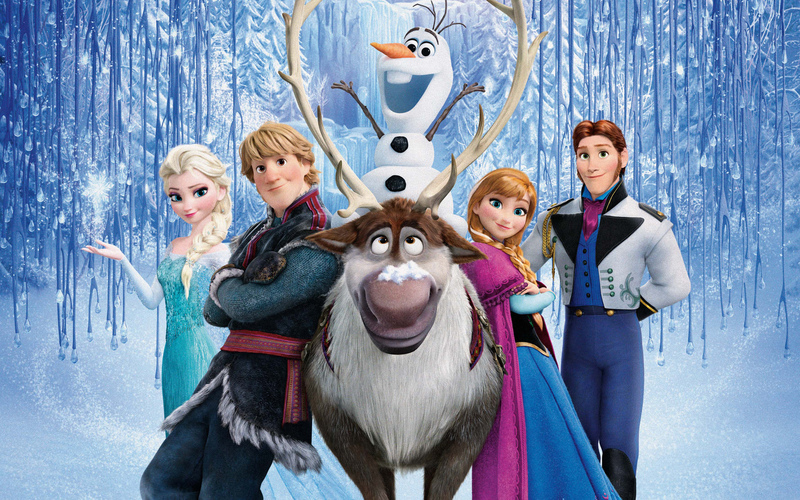 I’m not totally angry at Olaf. I’ve seen parts of it, but its insane popularity gives me pause. What makes it so popular? I don’t know how any Disney movie can be better than those of my youth. I was lucky enough to be born in the mid-1980s, just before the Disney Renaissance of The Little Mermaid, Aladdin, The Lion King, and Beauty and the Beast. Maybe I don’t get it because every little girl is obsessed with Elsa (and sometimes Anna). I teach dance to three year olds and they all love Elsa. My friends and I have debates over the best Disney princess. I’m on team Belle, mainly because she reads, and I identified with her in many ways when I was 6. Here’s my real beef though. I’m a big fan of Epcot. I have been for a long time, and my family always spent a lot of time there when we were kids. Epcot was quiet, pretty, and had some fun stuff (RIP Wonders of Life pavilion). 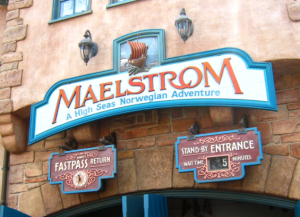 Even 7 months later, I’m mourning the loss of the Maelstrom. Norway does not equal Arendelle (although, from what I understand, it is inspired most by the nation of Norway). Many commentators have noted that it will make the park more attractive to younger guests. 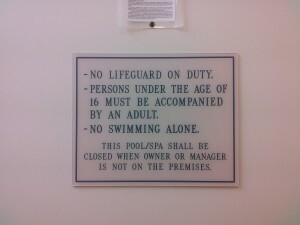 When was it inaccessible to younger guests? When I was little, we could visit with Dreamfinder and Figment! We exercised with Goofy! We found out how babies were made (sort of)! Hollywood Studios doesn’t have a lot to offer the younger set. It’s mainly thrill rides and loud shows. That’s what Fantasyland is for (and it’s why I avoid Fantasyland until after 8pm, when possible). The park is straying from its original mission, and I don’t necessarily support it. I understand rebranding The Living Seas. I definitely understand getting rid of Horizons (or as we thought of it: our Epcot nap spot). I just don’t believe that “princesses” belong in Epcot. Find a new way to engage kids with the information they are getting at the different national pavilions. Oh, and Mary Poppins is not a princess (duh, she’s a nanny), and I am always happy to bump into her at the Great Britain pavilion. Perhaps this is not the most academic of posts, but my irrational irritation with Frozen is starting to seep into my dissertation, and it definitely needs to stay out of that document. At EASA, I presented the research for one chapter of my dissertation. In short, my dissertation examines the intersection of popular culture, corporate culture, and the media in American culture (it’s a busy intersection…). Through two case studies for each of the three companies I am examining, I hope to illustrate how corporate culture, popular culture, and media can be discussed in the same forum, as well as how American studies theory and method is an excellent platform for investigating American business culture. It brings two academic worlds together that usually have little to do with one another. In this chapter, I look at the success of Walt Disney’s parks, specifically Walt Disney World. Walt Disney transformed the amusement park from the carnival-esque atmosphere of Coney Island and other Midway parks into a well-run, clean theme park. Much has been written about how Disney domesticates the spaces in his parks, taming every detail that would be left to chance in another park. Trash is sucked into underground Utilidors, gum is not sold in the parks (to prevent gum from sticking to everything in the park), and the bug situation is very much under control (leave Disney property at your own risk). However, I contend that Disney stands apart for another reason as well. He taps into a long-standing American amusement tradition that attracts guests and places the Disney parks in a different echelon than other theme parks. Disney and his company incorporate rational amusement into the parks, bringing an aspect of education and discovery to the land of Winnie-the-Pooh character breakfasts and Dole Whips. Rational amusement is not a new concept, but contemporary Americans probably don’t know it by any specific term. Modern pedagogy almost demands its use. Rational amusement (or rational entertainment) is the act of educating while entertaining. Born during the Enlightenment era out of the philosophies of Rousseau and Locke, it took hold in the U.S. during the American Revolution. Wartime (and its build up throughout the colonies) lead many leaders to ban “frivolous activities” in order to have its citizens engaged in only respectable activities and concentrating on the war effort. In order to skirt these regulations, amusements that could claim an educational angle opened. One of the most famous purveyors of rational amusement was Philadelphia’s Charles Willson Peale. Side note: Charles Willson Peale has been trying to make his way into my research for years. My alma mater, La Salle University, is built on his estate, and his home is where the President’s offices are on campus. It’s also haunted. Peale is best known as a portrait artist, as he painted many of the leaders of the early republic. He also had very talented sons with really cool artist names, like Rembrandt, Raphaelle, and Titian. After the Revolutionary War ended, he announced his “retirement” from painting, and he decided to open a museum. Peale was a Renaissance man who was very interested in the natural world, and he wanted a place to display his specimens and his portraits. He opened his museum, and before long, he moved it to the 2nd floor of Independence Hall, which is the location we best understand. He painted two works that show off his museum: The Artist in His Museum and The Long Room, which both were completed in the same year. The former is also used in many American studies classrooms to help illustrate the habits of mind necessary to analyze works in the discipline. His museum was largely a serious endeavor, as he hoped to educate the masses about natural science and the new republic. It was affordable to many and was even open later in the evening to accommodate farmers and other laborers who were unavailable during daylight hours. In short, it democratized education for many. During the 19th century, the laws governing amusements were repealed, but many amusements still maintained an air of education in line with the Victorian ideals of the day. P.T. Barnum and Buffalo Bill Cody were certainly not considered great educators, but they still exposed people to new concepts and the natural world (albeit with a lot of showmanship and some bearded ladies). Coney Island signals the end of this first wave of rational amusement, as it was amusement for amusement’s sake. People of all sorts of classes, races, and ethnicities mingled together on the shores of Brooklyn, and they were even pushed together on many of the rides. There is no judgement to be passed on Coney Island, but it simply a sign of a cultural shift. Simultaneously to the decline of rational amusement, the World’s Fairs started coming to America, which signaled that the infant nation was finally coming into its own. These fairs were showcases for scientific and engineering advancements. They also allowed Americans to experience other cultures in the national pavilions. 1876’s Centennial fair in Philadelphia is best known for the introduction of the telephone and the Edison lightbulb. the 1893 fair in Chicago, which celebrated the anniversary of Columbus “discovering” America, was split into a Midway (for amusements) and the White City (for science and information). Other fairs mimicked this set up. Does this concept sound familiar to you? It might if you have visited Epcot at Walt Disney World. It too is split into a section for national pavilions (the World Showcase) and scientific education (Future World). Walt Disney was no stranger to rational amusement, as he used them in his educational films and television shows. After his death, his original concept for a utopian urban community (Experimental Prototype Community of Tomorrow, or EPCOT) was transformed into a sort of permanent World’s Fair. It should be noted that only two years after Epcot’s opening, the United States hosted its last World’s Fair in Kentucky. The fairs (like the Olympic games) tend to be financially draining on the host nation, and no matter how many people cross through the gates, it tends to be a financial loss. Epcot was as well, initially. 1984 found the Disney Company at a major crossroads. Corporate raiders were ready to buy up the company and sell it for parts. Epcot was not making the money they had hoped, and since Disney’s 1966 death, the animated movies had lost direction (and lost money). New leadership (and the return of Disney family members) saved the company and ushered in an era of growth. The old Disney spirit had returned. The Disney Company understands where its strengths are, and one of those strengths in its parks is making knowledge (especially about science and history) consumable by the masses. Even though the stories are boiled-down and filled with the idea of American exceptionalism, I can’t help but love the shows at the American Adventure and the Hall of Presidents. The Universe of Energy at Epcot is still one of my favorite attractions, perhaps because of the combination of Ellen DeGeneres, Bill Nye (the Science Guy), and Alex Trebek. It is the unique combination of Disney’s parks and the way they present information that sets it apart from a Universal or Six Flags. It’s an all encompassing experience for the whole family. This post is boiled down from a conference presentation, which was boiled down from a 28+ page dissertation chapter. For more information, ask me! Or wait and read my dissertation. Spring has sprung again, and again we trek to the Eastern American Studies Association’s annual conference. I’ve been attending since 2009 as a presenter (I also attended in 2005 or 2006 as an audience member), and I really love the mission of this particular group. It is student centered, with a unique focus on the work of undergraduate students. It houses an undergraduate journal (the only one of its kind in American studies), the first national American studies honors society (EAK, which I feel like has the same name as a fraternity in Monsters University), and an undergraduate roundtable, which has become so popular that it split into two separate panels last year. I’m also honored to serve as the Graduate Student Representative on the executive board and as the interim regional representative to the American Studies Association (while our real rep is abroad). I dedicate serious thought and time to this conference (although not as much as last year, when I was a co-coordinator). Our theme was “Land and Sea,” and we joined with the Middle Atlantic Folklife Association (MAFA) to put together a really big event. 2015’s meeting was held at Rowan University in Glassboro, NJ over this past weekend (March 27 and 28, specifically). One of the pleasures of conference travel is the ability to do so with my graduate school friends, and this year was no exception. It was the usual suspects (Me, Becky, Andrea, Hilary, and Semontee) with the wonderful addition of this year’s co-coordinator, Christie. When you aren’t in coursework or teaching anymore, it is difficult to get to know the newer students, so it was nice to get to know her a little better. We got Starbucks, gabbed, laughed, panicked over our cars, and arrived at Rowan with little difficulty. I had no idea Rowan’s campus would be so large! It was really nice, and it looks like they are expanding and improving even further. The meeting was fruitful, and I was off to present at 2pm, the first session of the weekend. “Art and Animation: Reading the Land” was the title of our panel, and there were four very different presentations about New Jersey artists, Modern art and landscape, Donald Duck comics, and Walt Disney & Charles Willson Peale. The last one, perhaps obviously, was mine. I wish I had gotten more effective feedback and questions from the audience, but my moderator ended up being a great resource and new academic connection. She suggested investigating Woody Register’s Kid of Coney Island: Fred Thompson and the Rise of American Amusements. I plan on doing so this week. Thanks Elizabeth O’Connell-Gennari of Rowan University! My colleague, Peter Bryan, was a co-panelist, and I can’t wait to pick his brain more about his research. He and I frequently present together because of our mutual interest in Disney (albeit very different aspects of his work). 3:30’s “Roads, Rivers, & Racetracks: Americans on the Move” was not to be missed. I’ll admit: My sole motivation for attending this panel was the work of Ms. Hilary Miller, friend and fellow Downton Abbey watcher. Her dissertation work on the history of the National Road is really interesting, and her work in the archives pushes me to do more. She used National Road narratives to investigate how American identity was formed and perceived during the early 19th century. She was followed by another Penn Stater, Wes Stauffer, who has done great work in the field of World War II history, particularly here about the AlCan Highway. My dad is very interested in what one could call “historical logistics,” and that interest has rubbed off on me. Very cool stuff. Finally, Jonathan Silverman of UMass Lowell discussed his research on what has become of old horse-racing tracks, especially how he uses Google Maps to match the locations of old tracks with present day roads and developments. Many of them still exist in spirit as shopping centers, neighborhoods, and curved roads (mostly still possessing the theme of horses or racing). It was a whole new method that I had never considered! I needed to rest after this (I hadn’t slept well the night before and driven quite a lot), so Hilary and I debriefed with our friend Lynne, who drove in for the day from her position as Director of the Arch Street Meetinghouse. Go visit her. Reconnecting with people is a major perk of conferences like these. If you would like to read about the plenary session, “The Child of Such Union: A Forum on the (Em)Bedding of Folklore and American Studies,” see John Price‘s post on the EASA conference. The reception was lovely, and gave everyone a chance to regroup, have a beer, and catch up with old friends and mentors. We were warmly welcomed by members of the Rowan community, David Puglia (President of MAFA and a classmate of mine at PSH), and Nicholas Paleologos, the Executive Director of the New Jersey State Council on the Arts. We checked in at the hotel, and while some of us were tapped out from the day, others socialized over a drink and some apps at the restaurant next door. It was a very long day for everyone, and I’m glad I was able to muster the energy to share that time with friends. Saturday dawned cold and early. Cheesy, but true. After a quick breakfast of Froot Loops at the hotel (I’m totally an adult person), we jetted off to Rowan again for another three panels. 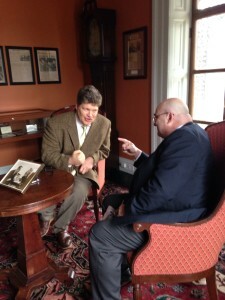 For a re-cap of the 8am panel “Mass Media(ted): Mediation on Pop Culture,” see John Price‘s blog. Because we got to the morning panel late, I decided to wait and have some tea. 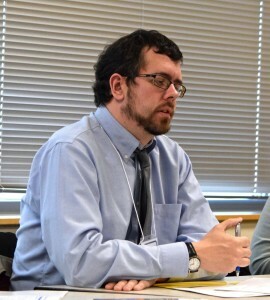 At 9:30, I attended a symposium on American Studies and Teacher Preparation. I attended La Salle University, which requires its Elementary and Special Education majors to double major in American Studies. It makes them more marketable and provides them with a wide subject matter knowledge base. Despite these advantages, few schools that offer both majors connect them in such a way. Rowan University is another that makes the connection, and while it doesn’t require American Studies as the double major, it encourages it. 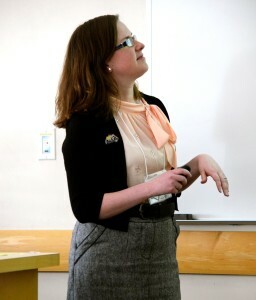 Rowan’s studies have found that those who double major in AMST score higher on the Praxis II content test over all four subjects, and that American Studies-trained teachers better prepare their own students for standardized testing because it teaches them to think recursively. Former students of both programs spoke on the advantages it gave them, some less obvious than others, and we discussed as a group what the barriers were to improving these programs. I was totally re-invigorated after this panel, and it makes me excited for the day I can teach at La Salle again. My biggest challenge as a professor at La Salle was reaching the education students and making American Studies relevant to them. Finally, I ended the morning supporting Becky Cecala and her research on the work on Dr. Josephine Baker. Her panel, “Gender Identities: Profession & Presentation” was diverse and fascinating. I was especially interested in Paulina Guerrero’s study of the Smith Island Crab Meat Co-Op. It was ethnographic research at its best. The weekend was capped off with lunch, awards, and an interesting ride home. The GPS took us a different route than I was used to in coming from South Jersey, which we found out was to avoid traffic on I-76 in Philadelphia. We stopped at Wawa for smoothies, hoagies, and some snacks too. Anyone who knows me was probably wondering when that field trip happened. During the last leg of our trip, we experienced a pretty insane snow squall. It was difficult to see, and it was gone as quickly as it arrived. It was a dramatic ending to our weekend. My thoughts on EASA are more well formed than last year. I have found myself “growing out” of certain conferences in the last few years. While fun, I really don’t see myself going to PCA/ACA anymore. I find that I get little effective feedback at the panels, and that networking is very difficult in my subject area. It also feels as though it is one person in a Batman costume away from being a very intelligent Comic-Con. I may also be outgrowing EASA as a presenter. I don’t get a lot of effective feedback, which is my major reason for presenting. Many of the attendees are other Penn State students, and they have already been my sounding boards. I have also found that too many projects come to EASA with no argument and no polish what-so-ever. It is a great place to start developing ideas, but one should at least come to the table with something. It may also be too friendly. I find that many audiences are reluctant to challenge a panelist in anyway. Yes, those challenges should come in a polite and collegial way, but we all need to be forced to defend our arguments. Others seemed straight-up unprepared or unaware of what presenting at a conference really entails. That said, I want to continue to attend EASA as a board member. The academic climate is changing, and I think an association as small as EASA can more easily change with the times to stay strong and relevant. I hope to help steer it in that direction as a board member. It should continue to be about the free exchange of academic ideas, while also guiding students of all levels through their research and academic careers. Essentially, EASA saves people from swimming through academia alone. I need to move from being a kid in the deep end to a lifeguard. PS: I hope to add more pictures later when the site cooperates. I think these are a nice taste of the weekend for now. Controversial Topics with the Lady Americanist. I’m not a controversial person by nature. There is almost nothing about me that would raise an eyebrow. However, I seem to gravitate towards research topics that really get people arguing. My undergraduate thesis looked at the psychological effects of 9/11 at the fifth anniversary. As part of this research, I also collected oral histories from people of different age groups to see how others processed the event. My mentor on this project was a psychology professor, so I followed all of the IRB rules, and I even learned to use APA citations. It was a wild time for the Lady Americanist. 1. People avoid the 9/11 project. It makes people uncomfortable, especially when you have a self-made film playing that celebrates the towers. 2. People are way more interested in the science projects than the humanities. It’s hard to present humanities research on a tri-fold board and make it interesting. That last one really got my goat. These folks never took the time to look at my thesis, which takes no political stand on 9/11 what-so-ever, but saw pictures of plans and the Pentagon and took that as an open invitation to ask me pretty inappropriate questions about pretty upsetting topics. So, rather than pursue this research further, which I regret and plan on returning to at some point, I changed directions as a Masters student. I figured something lighter would be best. Researching 9/11 for an entire year of undergrad is emotionally draining. I chose film as my focus in graduate school, and I decided to take my knowledge of New York City and use it to analyze the films of Woody Allen. If I thought I got uncomfortable questions with 9/11, they paled in comparison to those about Mr. Allen’s personal life. Again, my project had nothing to do with Woody Allen’s romantic life or really his life after 1986. My analysis was ignored by many at conferences, and I was asked a lot of questions about Soon-Yi Previn (her name never appears once in my thesis). My current research has its Disney-haters (but I can fend them off and ignore them…it’s a welcome break from questions about government conspiracy). However, I find that my topic allows for a lot more discussion about my research than invasive questions about my subjects. I do get the odd “Where is Walt Disney’s head frozen?” inquiry, but that’s more amusing than anything else. All this said, I never want to stifle academic discourse. I don’t love that these sorts of challenges got in my way of pursuing topics that genuinely interest me and have a place in the American studies pantheon. These sorts of questions belittled my time and effort on important topics. How Americans deal with events, both culturally and psychologically, is very important. How do you deal with insensitive questions about your research? It’s difficult to fend off a line of inquiry that is obviously meant to demean you or your research. Any advice (other than humor, which works with Woody Allen, but not so much with 9/11)? PS: This post was inspired by a recent viewing of the documentary The Woman Who Wasn’t There, which tells the tale of “Tania Head,” a woman who claimed to be both a 9/11 survivor and a 9/11 widow, both of which were lies. She got away with it for about 6 years, which just fascinates me. Even 14 years later, it is difficult to see what the broader effects of 9/11 have been. It’s definitely something I will be returning to after the dissertation is complete. As of October 3, I attained A.B.D. status. For the uninitiated, it stands for “All But Dissertation,” meaning that my only barrier to the Ph.D. is the dissertation. It’s a big deal (not as big as the Ph.D., but I’m right on target for my program, and that’s a positive thing), and I frequently get asked how I did it with a kid. First, let me say, I have the most agreeable child in the world. He is very good at entertaining himself so I can write or grade, and he is patient to go to school with me to run errands. This was a major factor in my success. In addition to that, I have a very supportive spouse, who wants me to finish the program almost as much as I want to be done. He creates an environment that allows for me to write everyday and do my research. Second, I am lucky to live near both my parents and my in-laws, who stepped up with alarming frequency to provide me with both study time, time to teach, and date nights. My mother-in-law is a constant saving grace because she watched E almost every day that I went to school. I seldom had to ask for help, because those around me knew what was involved and stepped up. 1. Get and Stay Organized: To me, this is the key to all success. I’m a huge fan of a good planner, a sturdy binder, and lots of lists. Use what works for you. I can talk for days about my Moleskin weekly planner and monthly planner and how I would be lost without them. But if your phone calendar works better, by all means, use that. If you have little hands around, keep this stuff out of their reach. Don’t risk it. 2. Do YOUR Best: It’s very easy to get competitive in graduate school. In my program, it’s not worth it because we are all studying diverse topics, and by and large, we don’t compete for resources. My friend’s dissertation about women of science is in no way competing with my dissertation on corporate media. So, I just had to concentrate on doing my best work, not THE best work. It resulted in success for me because I was confident in my ability to perform quality scholarship. 3. Just Get It Done: It’s easy to have flexibility in the timeline of a graduate program. Barring serious issues (illness, death, etc. ), try to stick to the fastest timeline. The longer you take, the more money you lose, either in tuition or lost employment. It’s easy to say, “Oh, I’ll just take one class this semester,” but if you can handle two, by all means, get it done. 4. Be Proactive: Have a back-up plan for everything. Save your work to Google Docs or a flash drive every day that you write. Have a babysitter on call or a way to take your kid to school with you if you are able. Don’t wait to register for classes, because if you can’t get the ones you need, you need to set up an independent study or readings course right away, which can be a challenge. Do not leave things to chance. Now I’m continuing work on the dissertation, which is going well. I have numerous chapters in process, and I hope to be done in a year or so. I’ll try to take my own advice. **This post is copied from my personal blog, but I felt it applied to both realms. I bet you thought this would be an inspirational post about persevering through adversity. You would be wrong. I don’t write inspirational posts in that vein. Until about a year ago, you could say I was terrible at packing for trips. The best example of this was my honeymoon. I bought the biggest suitcase I could find and filled it to the gills. It was almost half my body weight. Those who know me know that I am not a fashionista, nor am I terribly high maintenance in terms of my hair or make-up. I just wanted to be prepared. But for what? It was 3 nights of cruising followed by four nights at Disney World. I knew what to pack on both fronts, but I feared not bringing enough. It was unseasonably chilly in Florida that year, and I ended up wearing my one pair of jeans almost every day in the parks. I used about half of what I brought as a result. Anyway, when I started attending conferences in graduate school, I realized that I needed to pack more efficiently. On my first multiple night conference as a Ph.D. student (PCA/ACA in D.C., 2013), I found I struggled with my luggage on the train (we had to change trains in Philly to get to D.C.; it was a challenging ride, to say the least). I brought way too much. 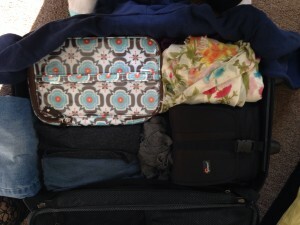 The next long conference was to D.C. again, and I again overpacked. I thought the event was more professional dress, only to find that I was over-dressed. Oops. Last year, I flew to Chicago for a conference that lasted 6 days and 5 nights. I’m a nervous flyer, and I didn’t want any issues with my baggage, so I committed myself to carry-on only. I managed to pack an outfit for everyday, plus my presentation outfit, PJs, shoes, toiletries, AND my camera bag in a carry-on suitcase. I also took a backpack for my laptop and such. I wore everything I took and my only regret was my shoe situation. I only packed Toms (which I wear everyday from March to November) and heels. Well, it rained the day we left and my Toms got soaked. They dried out fine and worked OK, but I wished I had a pair of back up flip flops or something. This tip is perhaps the most helpful. 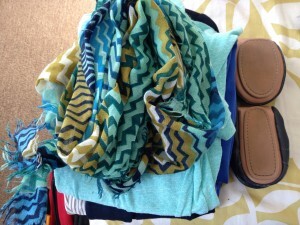 Attempt to bring clothing and shoes that all coordinate, or at least mostly coordinate. I am a huge fan of navy, white, and grey, so that is what I tend to pack, with a few accent pieces in mint, coral, and yellow / gold. This allows you to re-use pieces if you need to, especially pants, shoes, and jackets, which take up a lot of space. It also prevents me from bringing too many scarves. I love scarves. Get the tiny toiletries. If you can, use the hotel stuff. It’s not for everyone or every product, but it cuts down on bulkier items like soap. I put my hair products (wax and straightening cream) in a contacts case. It was more than enough, because I use so little, and took up very little room. If you are traveling with close friends or family, perhaps coordinate toiletries. On my Chicago trip, one friend was checking her bag, and she brought body lotion for everyone in our room. This tip also applies to HOW you pack, not just what you pack. Use all the space in your suitcase. There are a lot of handy guides on Pinterest, and the best advice is to roll your clothing. Socks into shoes. I even roll my underwear. Not only is it a space saver, but it prevents wrinkles. Put things where ever they will go. My camera bag also houses my presentation cards (for conferences), tea bags, and hot chocolate packets (in a separate pocket and Ziploc bag, no worries). With your personal item (backpack, purse) you can get a lot of use out of those items as well. If you have a lot of reading to do, just pack a Kindle or e-reader. It may not be your preferred method to get your reading list completed, but your back will thank you. Ditch the extension cord part of your computer cord. Take unnecessary things out of your wallet. Little things make a big difference! Have a good idea of what each day holds. Perhaps you are going to a wedding, but know exactly what events are planned for each day. For conference trips, I know what day I present and coordinate my casual and presentation outfits accordingly. You won’t be caught off guard, and you’ll have just what you need. For ASA, I wore a lace skirt with a blue blazer. After the presentation, I ditched the skirt and went for a pair of khaki shorts. Plan outfits that go from day to evening (or presentation to sightseeing) easily. My flying outfit: blazer, comfy but nice pants, t-shirt, scarf, and shoes that are easy to remove at security. Unless you traveling to a more remote locale, you are always near a mall, drug store, or grocery store if you forget something. No one wants to spend extra money on a trip, but it’s not the end of the world and you won’t spend as much as you would to check the bag. I have some other items that I like to bring on trips. I always bring a soft purse that I can pack during travel, but that I can use once I get to my destination. I also bring a light blanket with me. It folds up small and is just the right size for a cold plane or train. It can also double as a pillow. I also travel with food. I like to snack and eat, but I hate paying for restaurant food all week at a conference. I especially recommend fruit leather, Cliff bars (good breakfast), peanut butter M&M’s, and any other small nosh. I request a fridge if it doesn’t come with the room, and I try to find a grocery store or CVS near by to get some yogurts and such once I arrive. It stores leftovers too! Finally, enjoy the conference! It’s a professional trip, but they always present opportunities to see new things, meet new and fascinating people, and get effective feedback about your research. If you recall, I was very wishy-washy on ASA (American Studies Association) last year. The 2013 meeting was controversial, tense, and a little stuffy. The Student Association events were a bright spot, and when I found out that the award I won at EASA came with a spot on an ASA panel, I decided to give the conference a second chance. I’m glad I did, although I still don’t see myself making the ASA an annual pilgrimage. My trip began with a quick drive to my grandparents’ house. I wanted a direct flight to Los Angeles, and Dulles was the best option. However, it is 2 hours away from my home, and my grandparents live half way. Just as I was preparing to leave (at 4am), the power went out. And they live in the hills, where it’s dark even when the power is on. I felt bad abandoning them in the dark, but I had to get going. It was pouring rain, and it made for a very stressful ride to Dulles. However, after that the flight out was uneventful. Easy time through security and such. I even discovered that Starbucks makes a peppermint mocha frap, which makes me both happy and a walking, talking stereotype. Oh well. Grand Central Market in Downtown, L.A. The advantage of flying west is that you get three hours back. THREE HOURS. It’s like the flight barely happened. I got settled at the hotel, registered at the conference, and started figuring out which panels to attend. The first panel I went to was a Student Association workshop on “perfecting your pitch,” in which we gave our short (3 minute) proposal on our dissertation / project and receive feedback from a professor who has never heard it before. I spoke with Prof. Libby Anker from George Washington. Her feedback was refreshing, and it was especially nice to hear from a female in the field. She told me to be less apologetic and to emphasize the scope of my project rather than apologize for it. She liked my project, which was validating because I was convinced it wouldn’t fit in at ASA. Thank you Dr. Anker. My roommate and I attended a lot of student events, including the opening night mixer. The graduate students at ASA are really wonderful to interact with, and we really got effective feedback at all of the student events we attended. 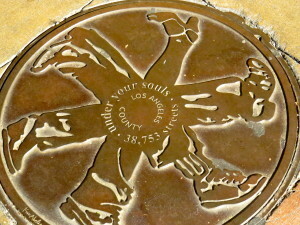 Social conscious manhole cover, Downtown L.A.
A colleague from the Penn State Harrisburg American Studies program, who is now at William and Mary, presented on the first day, and he did a fantastic job talking about the intersection of country music and race. My first day was rounded out with the Regional ASA meeting, at which I represented the Eastern American Studies Association (EASA). Our real rep is in India, so I was happy to fill in. I was fascinated to listen to how other regional ASA’s deal with having conferences. We are lucky enough to have a condensed geographic area and a lot of passionate people on the board, and therefore EASA has an annual conference that fills up every year. SASA (Southern ASA) has a conference every other year, while the Rocky Mountain ASA (which encompasses 8 very large states) has difficulty finding a way to make a conference possible for all attendees. 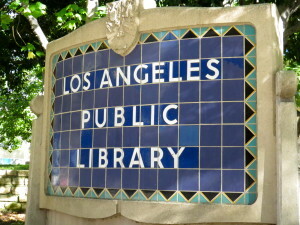 Los Angeles is a strange city, and it was difficult to sight-see without a car. My roommate is a lot more intrepid than me, and she pulled me out into the sunlight to see some very cool places just around our hotel, including the Grand Central Market. On the last day, we walked towards the Staples Center, but it was really just movie theatres and regular outdoor malls. I wish we could have seen Hollywood or Santa Monica. Next time. The student award winner panel was one of the most amazing panels I have ever been placed on at a conference. The discussion was substantive, helpful, and lively. People really understood my research, and it was really an honor to be recognized along side the other winners. I left the conference as a whole ready to dive into writing my dissertation. I also attended a panel called “Killing the Keyword,” which was a non-traditional event in which everyone put a word or concept that they feel is overused or used incorrectly into a bowl. The panelists then pulled each one out and discussed it at length. Most of the words were just discussed and clarified, but some were “killed.” Neoliberal(ism) was one of the killed words, primarily because people tend to use it as a crutch to sound smart, rather than applying it appropriately. I put that word in the bowl, as did about 40 other people, so it was nice to hear a real discussion about how accessible we are as writers. My flight home was exhausting, but that’s what you get when you take the red-eye. I was thrilled that I could take that trip, and that it was eventful in all the right ways. I had never traveled alone like that, and so that was a nice change of pace. My roommates were very nice, especially Brittany, who became a fast friend. She’s doing really great work in the Appalachian region, and I think she is going to effect change for that area of the country. Next week I go to EASA for the 7th time as a presenter. It will be much more relaxing than last year because I did not organize the conference! I’ll write more about that later. Let me start out with a fact about myself: I LOVE musical theater. I grew up doing musicals in high school and college, and I listened to every cast album I had access to. One of my favorites? Cats. No judgement. Many television reviewers don’t seem to get musical theatre, which is fine because they are television reviewers. They are not fond of NBC’s recent attempts to bring musical theater to the masses. I didn’t watch The Sound of Music last year because I am a huge fan of the 1965 movie, and I just knew I wouldn’t be able to watch it without over-judging it. Carrie Underwood is very talented, but Julie Andrews / Mary Martin she is not. Many of the complaints I heard, aside from the issue of Underwood not being a great actor, were issues that live theater always deals with. Things fall. Curtains don’t go up. People make mistakes. IT’S LIVE! I was hopeful for Peter Pan because I thought Christopher Walken was a good choice for Hook, and I hoped my son would enjoy it because he loves Jake and the Neverland Pirates. Well, the movie lost me a few minutes in. It was Sslllllloooooowwwww. There was very little energy, except among members of the ensemble, and they dubbed the tap dancing, which didn’t even match up with the dubbed sounds. However, I think NBC’s intent is lovely. Broadway musicals are not accessible to many, either because of price or distance. When schools need to make budget cuts, arts programs almost always go first. Event programming is fun too! Gathering around the TV with the whole family to watch something really special is a nice way to spend the holiday season. 1. Pick a musical that is known, but not overdone. Peter Pan has been done a million ways from Sunday. There is a Disney treatment (without the same music) and the Mary Martin / Sandy Duncan / Cathy Rigby versions, all of which were parts of every musical kids’ childhood. There are ample chances for disappointment. While The Sound of Music has just the one movie version in addition to the stage show, the film won the Oscar for Best Picture (1965), and is one of the highest grossing films in America. NBC is planning to air The Music Man next year (while Fox is going to produce Grease, which will probably sound like Glee). YES. THIS is the type of show it should try. People know it, since most high schools put it on every few years, but it can be easily made into a vehicle for someone. 2. Really do it live. Don’t pre-record things. Find a way to make the tap dancing (or Marian the Librarian foot stomping) heard live. Encourage an energetic performance. There are loads of people right in NYC (where NBC broadcasts these musicals from) who are full of real energy and talent and very accustomed to performing live 8 times a week. I feel like the ensembles come from this core, but cast more of the leads this way, please. Peter Pan‘s Smee / Mr. Darling is an alum of Legally Blonde, and it was evident in his performance. 11pm is late for most people, especially school age children. I realize the show will have to be three hours with commercials (and most musicals are kinda long), but you need to meet your audience half way. DVR’s work, but NBC is going for a live event. 5. Give people a reason to watch aside from hate-watching. To be honest, most people without children who are watching are doing so only so they can bash it the next day at the Keurig machine. I don’t have a solution to this yet, but there has to be a way to increase expectations. 6. Film it like a movie or a live event, not both. In live theatre, everyone’s expressions are exaggerated and movements are different than in film because the audience is so much further away. With a live TV event, energy is there with the camera right in the actors’ faces. It’s awkward. There is another problem that NBC can’t really get around. Many of the classic musicals that are family friendly are also seriously outdated. Many articles have already noted the changes to Peter Pan to be more sensitive to Native Americans, but the gender relations are pretty pathetic, and kinda weird considering you have a young woman playing a perpetually young boy. For some reason, many of the “classics” take place between 1890 and 1914. 4 of the 5 high school musicals I did were set in that time period, including The Music Man. More modern “family friendly” musicals are just adaptations of movies (Elf, Shrek). Musicals that are compelling to the 18 – 49 demographic are too heavy for primetime network TV (see: Assassins, Urinetown, Company). It’s a complicated programming issue that has no single solution. I want to see NBC continue this live musical idea, but they need to work on some of the core issues that made Peter Pan weak. Bringing more traditional forms of the arts to television is an important public service, in a way, and I hope NBC doesn’t lose their nerve. Every season, a flurry of editorials and articles proclaim the season as the “end of Saturday Night Live,” and that the show has lost its edge. They say the current cast just isn’t “x cast from 19xx” and that the show’s ratings spell disaster and cancellation. First, the success of Saturday Night Live is an anomaly in itself. No show has ever succeeded this long at 11:35 on Saturday nights. It’s main competitors? Sleep and da club. If people aren’t watching SNL, the odds are good they aren’t watching anything on television. Perhaps they are binge watching The West Wing, which is what I am doing as I write this. One must place the ratings in context as well. This past week, the show earned a 1.8 Nielsen rating. The Big Bang Theory, the only comedy among the top-ten shows, earned a 9.1. However, during its final season, Seinfeld earned an average rating of 21.7. The diversification of programming makes it difficult to even compare apples to apples. Second, one of the biggest criticisms is that “SNL was funnier when so-and-so was on.” Let us consider a few points. Comedy is subjective. We live in a world where Louis C.K., Jeff Dunham, and Jim Gaffigan are all very popular, but very different, comedians. Fans of Gilda Radner are not necessarily going to be fans of Cecily Strong (although I am big fans of both ladies). That aside, and its an important point that I beg you not to ignore, every sketch is not a success. For example, last weeks episode (40.3 with Bill Hader) had a pretty lame cold open (Bobby Monihan as an injured Kim Jong Un), but also featured some very funny sketches with Hader reprising old characters and the “YA Trailer” digital short. SNL also doesn’t have to be constantly funny. Upon the passing of both Jan Hooks in 2014 and Phil Hartman in 1998, the program showed a sketched called “Love is a Dream.” It’s certainly not funny, but it’s beautiful. “La Dolce Gilda” is another piece of social commentary that features Radner in a Fellini-like film. “Don’t Look Back in Anger” is a look at an aged Belushi (who would never reach such a state) thinking back on his friends’ lives. All are Tom Schiller sketches, but they point out the larger importance of the show. MadTV or In Living Color would never present sketches like that. SNL has the social capital to experiment and live to see another day. That’s why it’s not always funny. Repeat sketches are winners. The Bees, Wayne’s World, the Cheerleaders, and the host of Weekend Update “editorial commenters” will always bring a laugh. However, audiences don’t want repeats every week. We expect them to experiment, and when they get it wrong, correct it. Most recently, Leslie Jones was finally made a featured cast member after some very funny guest appearances. Producer Lorne Michaels seeks course correction. The show is important to television and comedy on both a global and local level. Each season is a commentary on the goings-on in the world, perhaps a little time capsule. However, the show also illustrates the long-term impact of changing boundaries on television and in comedy. Without the training ground of SNL (which is the finishing school for sketch comics out of the Groundlings, Second City, and the UCB), we might not have Bill Murray (heaven forbid), Tina Fey, Kristen Wiig, and Julia Louis-Dreyfus. It allows us to watch these performers and writers grow and evolve, and eventually, fly away from the nest. Or, in a more concise way, next time someone tells you that SNL isn’t “funny anymore,” just roll your eyes and move on from their uninformed opinion. The Lady Americanist on Writing. Things are ramping up here with the Lady Americanist. I finished comps, I defend in a few weeks, and I have to get a chapter of my dissertation ready for presentation at ASA in November. I’m trying to really get through my dissertation now that I’m not teaching, in hopes that I finish my degree either next fall or spring 2016. I refuse to putz. My dissertation isn’t organized into regular chapters, but rather into “modules” that contain background information, two case studies, and analysis on a media corporation. Each case study will be about the length of an average chapter (20 pages), but the intro to the module will be about 10 pages and the analysis 25 – 30 pages. I figure as long as I draft about one item per month, and keep two others in the cycle, I’ll be done in about a year. I have one chapter near completion, another in rough draft form, and others that are either outlined or planned out. I think this is a doable goal, but we’ll see how research progresses. When I write, my pieces go through distinct stages. First, I plan. What is my thesis statement? What are the main points of support? I write this on an index card and keep it with my research materials. This helps when I get lost in the research. Sometimes it’s very difficult to see the forest through the trees. My chair is helpful in this regard because he can easily set me back on course. Next I outline. This is not necessarily a traditional outline with Roman numerals, but sometimes a chart with my points on one side and sources on the other. I used this to propose a chapter about the Pentagon Papers. It helped to show that I knew the important sources and where to find them. The outline is what I need it to be. A method that isn’t flexible isn’t terribly helpful in the long run. It has to adapt to the type of chapter you are writing. Here is where I finally get into the writing stage. I write everything I already know or have source material for. This helps me see the gaps and get words on the page, which frankly is a major part of the battle. I try for between 10 and 13 pages in this stage. Finally, I complete the draft, put it through some revisions (which I do almost exclusively on paper; I hate editing and revising on the computer), and create a final draft for my committee to evaluate. They have seen one chapter (well, most of them have…), and I’m hoping to give them another at the end of October. Our department is a little understaffed, so I need to keep myself busy while they work through all of the comps, drafts, defenses, and grading that they have to do (in addition to, you know, their lives). I have a Pinterest board about dissertations that seems to be getting some followers, so it must make sense to someone. Please feel free to follow me!